Authorities in Beijing have closed 24 schools for children of migrant workers just before a new semester is to begin, arousing wide public concerns over inequality in education. 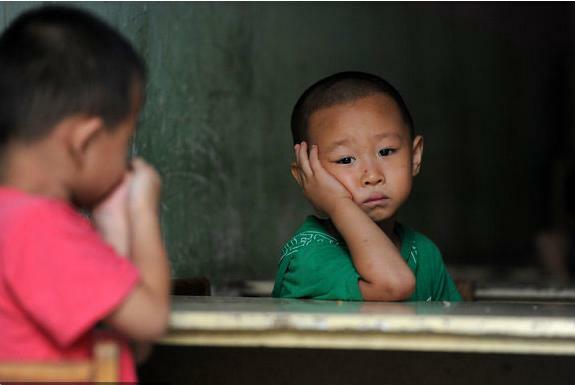 Two boys worry about their schooling for the coming semester in Beijing on August 15, 2011. Their primary school, where most pupils are the children of migrant workers, was demolished on August 10 after the contract between the school and local government ended. More than 14,000 children, mostly in the outlying areas of Haidian, Chaoyang and Daxing districts, were affected by the closure of the schools, Xian Lianping, deputy director of the Beijing Municipal Education Committee, said Tuesday. But a local newspaper, the Beijing News, put the number at 30,000. It reported Tuesday that about 30 schools were shut down, some of which have even been demolished. Education officials from the three districts told Xinhua that those schools were closed because they had not won approval from education authorities and they had not met the required standards, such as in quality of construction, sports facilities, food and other safety issues. But in practice, unlike government-funded schools, it is difficult for those privately-run schools to meet those standards because their classrooms are usually old houses rented from local villages and they lack strong financial support. "I have applied for a school permit since 2002 when my school opened, but the education authorities have never given an approval even though I have done a lot to improve the school conditions," a school principal surnamed Yang in Daxing District was quoted as saying by the Beijing News. News reports about the school shutdowns and photos showing angry parents outside the closed schools have given rise to widespread concern on the Internet. In a photo filed by the Beijing News, a protesting father lying on the ground outside a closed school in Haidian District on Monday shouted helplessly: "We have also made contributions to Beijing!" "It exposes the inequality in education. Why those children of migrant workers cannot have a school to attend? Just like those children of Beijing's denizens?" said one posting on Weibo.com, China's most popular microblogging website. "Please help them and let the children go to school!" another posting said. Due to restrictions of China's "hukou" (household registration) system, migrant workers, usually farmers from backward rural areas, in cities cannot enjoy the same treatment in terms of education, medical care, social insurance as local hukou holders, although the government has taken measures to address the issue. In Beijing, there are more than 400,000 children of migrant workers and more than 70 percent of them attend government-funded schools, said Luo Jie, deputy director of the Beijing Municipal Education Committee. About 100,000 children are studying at 176 privately-run schools, of which 62 have won approval from education authorities, Luo said. "The other 114 schools have not been approved, involving more than 40,000 students," he said. Of those, more than 20 will be approved soon, about 50 still need financial support for further construction before they get permits, and about 30 others have no safety guarantees (and need to be closed), he said. The committee has ordered education authorities in all districts concerned to ensure that every child has a school to attend before the unapproved schools are closed and classrooms are demolished, he added.